Home Basic Date Questions Questions using library methods How to get Time Zone information in Java? Write a program in Java that prints Time Zone information of current date. A time zone is a region where the same standard time is used. In java for getting time zone we have following 2 methods in TimeZone class that is present in java.util. * package. static TimeZone getDefault() - Provides default time zone. It gets the time zone by System date. static TimeZone getTimeZone(String id) - Provides time zone based on ID. For example - if ID is "Europe/London" then it returns time zone in GMT. * @problem How to get time zone information? // Get Default Time Zone. Output - How to find time zone information in Java? 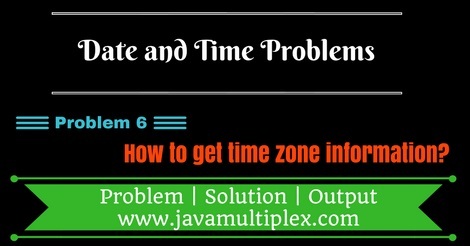 Tags : Date and Time problems, Timezone information in Java, Solution in Java, String, SimpleDateFormat.